During a ‘high demand’ market where prices are growing quickly, along with other situations, you’ll sometimes come across Estate Agents asking for ‘sealed bids’. This system is designed to help the Vendor achieve, potentially, the highest offer as those bidding should in theory at least offer as much as they can afford. Below is some guidance to help you when involved in or considering such transactions. 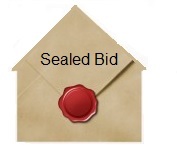 Whilst often the case, sealed bids don’t always result in the highest bidder getting the property and there are accusations that the Estate Agents or others involved in the sale, may choose their ‘favourite’ bid, which might be someone who has a more advanced offer such as mortgage approval in place for instance. The current system is virtually impossible for a buyer to monitor or control as those selling the property have all the information whilst the buyer may have very little or even none. Furthermore because it’s not a legally binding decision, if another buyer appears with a higher or better offer, it may all change so be wary when involved in such transactions and ensure you have your ‘ducks in line’ so you can move quickly. Make an offer before it goes to sealed bids. Remember there are likely no fixed rules in a negotiation situation such as this. If you do get involved in the sealed bid process, ensure you have read the ‘rules’ that form part of the process and ensure you adhere to them. As you don’t know what others are bidding, if you really want the property then you should disregard what you think others are paying and offer as much as you think the property is ‘worth’ to you. Remember though, if you’re a ‘special purchaser’ for instance you’re buying next door to your mum, then the Mortgage Valuer should disregard your purchase price and may well adjust the price to reflect a ‘market reality’. Whilst the amount you bid is important, remember it’s also about how quickly you can move, have you got funds secured, etc… Dress up your offer to ‘sell’ your offer to the Estate Agent and the Vendor. Remember though, keep the moral high ground and don’t tell untruths in such transactions. Try to find out what you can about the Vendor, why are they selling, do you have any contacts who know them (check Facebook, Linkedin, etc..) essentially you’re trying to increase the likelihood that they will accept your offer and it’s harder to turn down someone you know or is a ‘friend of a friend’. Ensure you get the appropriate type of survey done before the date for sealed bids, this is important so your offer doesn’t have to be subject to survey and will show you are committed to the purchase. Again, this will can make your bid very attractive. Point to note though, Estate Agents and Vendors aren’t fools, they know that if you have spent money on surveys, etc.. that you are less likely to walk away and as such you may find it more difficult to obtain the lowest price possible. Create a list of your advisers, such as solicitors, etc.. and provide this to the Estate Agent/Vendor to help speed up the process. Remember that you’re involved in a process, one that may take some time, so you may well not hear the outcome for several days or longer. This short summary guide is provided to you by Wayne Norcliffe BA (HON’s) DipHI ICIOB, MISVA, MRICS, RICS Registered Valuer. Castle Surveyors Limited would be pleased to assist you in your purchase if we can, you can get a FREE NO OBLIGATION quotation by calling us direct on 0800 246 1002.